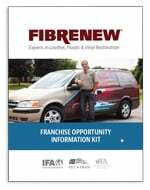 Jeff Hecker from Fibrenew Three Rivers, Pittsburgh launched his Fibrenew franchise in 2003. Since then, he has grown it into a thriving mobile service business. In this 3 minute video, he speaks about how he came to discover Fibrenew, his experience with Fibrenew’s support and products, how he has built his business and more.